One of very few indie label releases on Spin Magazine's list of 100 top counter-cultural music, ahead of legends like Mulatu Astatke, Brigitte Fontaine, Pärson Sound, Ornette Coleman, Sun Ra and His Solar Arkestra, Harry Partch, and Os Mutantes. Zowie! "In 1965, eight guys from London, Ontario, decided to start a free-improv group — 'free' to the point of building their own instruments, which they decided couldn't be set up to produce specific pitches. The band got together once a week with their electric kazoos and kludged-together guitars and Art Pratten's 'pratt-a-various.' Their vocalist, schoolteacher Bill Exley, banged on a cooking pot and bellowed hilariously about stupidity and destruction and Canada. They didn't treat what they were doing as an advanced, visionary form of experimental music, but as a big, stupid, fun, ecstatic noise. 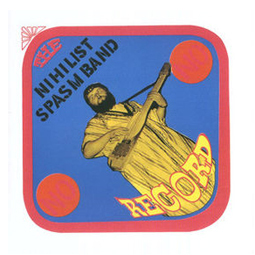 By the '90s, noise artists finally recognized NSB as their ancestors — and, almost 50 years after they started, the surviving members of the Nihilist Spasm Band still play every Monday night while their children haunt loft spaces the world over." —Spin "The record you’re holding is one of the masterworks of that big gray area of noise/weirdo/freak-out music. It’s still hard to believe that No Record was released in 1968. This was a time when popular music was still growing up, and these outsider guys from Canada came out of nowhere and made this mindfuck of record that was years ahead of itself. And as with albums like Trout Mask Replica, and The Faust Tapes, it still sounds fresh today. No Record is mandatory listening. —Lasse Marhaug. •from the master tapes. •limited edition of 500 copies. •huge insert with the band’s story and rare photos. Το προϊόν αυτο προστέθηκε στον κατάλογό μας την Wednesday 27 March, 2019.